Behold the devastating legal team assembling to get to the bottom of things in the swift approaching, ‘Witness of the Prosecution’. Yes, production week is upon us and with but one more dress rehearsal to go, we are almost ready to go to court on the matter. As one would imagine with a piece written by the grand dame of Crime fiction herself, Agatha Christie, this has proven to be a popular draw for audiences and both Thursday and Friday are near sell outs with a few tickets still left for Saturday. There is good reason why the BBC, in the wake of their tremendous success with ‘And Then There Were None’ last Christmas have chosen the play as this year’s festive offering. A marvelous mixture of whodunit and courtroom procedural drama, it offers a colourful collection of characters from across the social spectrum, a dastardly crime and a variety of narrative threads and red herrings that will leave the audience guessing until the play’s very last twist. And all this set to a distinct 1950s period flavour and meticulous sense of detail which promises engagement and immersion throughout. So, if you haven’t bought a ticket there is still time, no question it promises to be a wonderfully enjoyable show. I’ll be back with my summary remarks before curtain up on Thursday, but for now I’ll leave you with this suspicious bunch of ne’er-do-wells. And who are these coves? Well you’ll have to wait until curtain up to find out. Has it really been that long? A four month suspended sentence? Oh my! Oh dear! It is insane to think that the last time I was hunched over a keyboard sharing my Matchboxian thoughts was with a cool summer breeze wafting gently across one’s luxuriant mane, the promise of drinks on the veranda and the lazy prospect of summer holidays to come. And here we are now, surrounded by the gloom of November, ankle deep into the term, waking up in the dark, going home in the dark, autumn snuffling outside the window. I must have been busy. But that really is no excuse. The words on the job description say it’s about ‘keeping you up to date with all things Matchbox’ and in that I have been most remiss. And for that I humbly apologise. Such a lapse will never happen again and I ask all of you to point me to those words in the future if there is even a whiff of my abandoning post again. Enough prostrating and subservient apology seeking, though – the blog is back. To be honest, activity with the Matchbox never really went away and the past two months have seen the hall steadily changing into the Number One court of the Old Bailey as Leonard Vole is brought to trial for the suspected murder of Ms Emily French in 1950s London. Defended by the eminent Sir Wilfred Robarts, Vole professes he is an innocent man, but there is evidence to suggest the contrary, in particular the words of a certain…witness for the prosecution (cue credits). Yes, if you hadn’t guessed it from the brief synopsis above, this year’s December play is Agatha Christie’s (wait for it)…‘Witness for the Prosecution.’ A classic murder mystery with many twists and turns, this piece nonetheless differs from many of her other works in taking the action from the manor houses and homes of the wealthy where the butler might have done it, to the gripping byplay and drama of the courtroom. 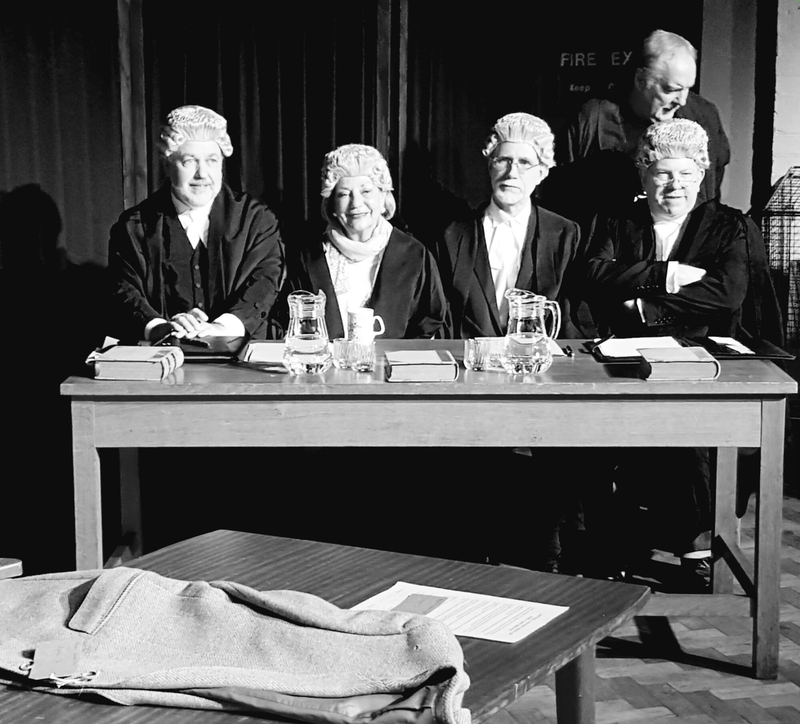 Directed by Vicky Pearce with her characteristic attention to detail and verisimilitude, here is a piece which effectively recreates the look and atmosphere of court providing many surprises in both drama and story. Even if you know this piece or have seen it before, it is likely you will not have witnessed it presented quite like this and there are twists in store for Christie newcomers and old hands alike. 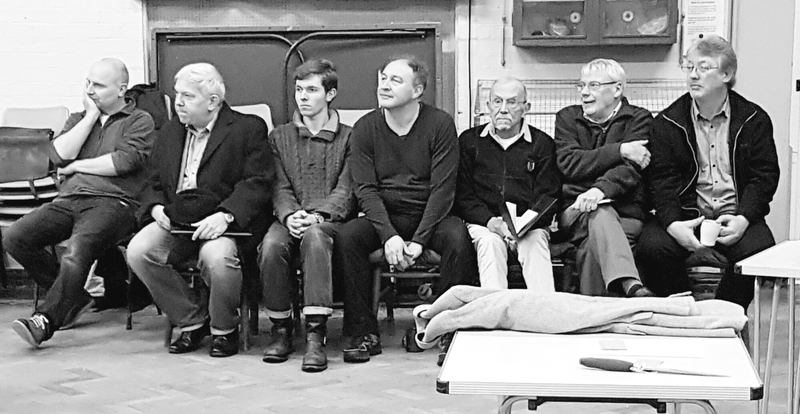 With a large cast of Matchbox members old and new, young and old, it draws on the wealth of talent which the group possesses and promises tension, humour and the occasional sharp intake of breath when it is fully realised on both the stage and in the round between 1st to 3rd December. As you can imagine, this will be a very popular show and tickets are already selling very well, it really is a case of book early to avoid disappointment. Apologies again for being away so long, that in itself has been criminal, but suffice to say that is a thing of the past and the Matchblog is back in business. Look forward to seeing you here in the very near future.